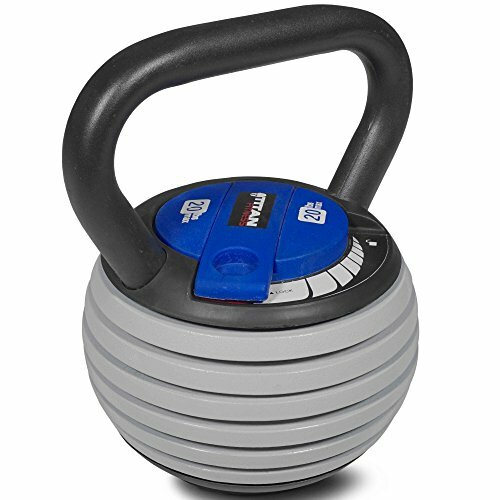 The adjustable kettlebell from Titan Fitness is ideal for explosive exercises that work major muscles, build power, and burn body fat. No need for a whole rack of kettlebells to get a great workout as many exercises only require just one, or a pair. Easily convert it from 5 lb up to 20 lb by releasing the lock mechanism to add or remove extra weight plates, which makes it perfect for a group of people who work out together! The powder coated finish is durable and made to last for years or tough use. Drop cast iron plates with a flat base for easy storage. Extra wide handle for easy grip. Mechanism easily adjusts weights and has 6 adjustable weights. Material: Cast Iron / Finish: Powder Coated. Perfect for beginners or more advanced athletes.